Loving husband of Ena. Father of Eleanor, Moira and Pauline, father-in-law of Paul, Mark and Sue. Grandfather of Lauren, Alex, Adrienne, Lewis, Charlie, Liam, Nick and Ryan. Great Grandad of Hannah, Cash, Ari and Chilli. You put up such a good fight over the years, but passed away peacefully 06.04.2019. Forever in our hearts and memories, you will be sadly missed. 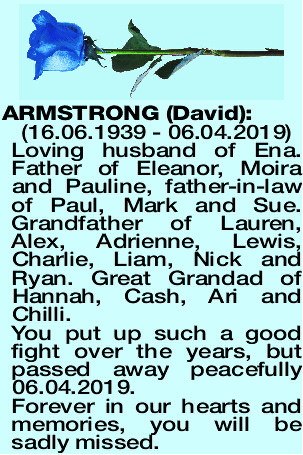 A Service for the Late Mr David Armstrong of Thornlie will be held on MONDAY (15.4.2019) at our Seasons Canning Vale Chapel, 1 Tulloch Way CANNING VALE at 2pm. 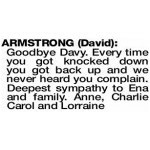 Goodbye Davy, you were admired by us all for facing your problems with such courage. Thinking of all the family. 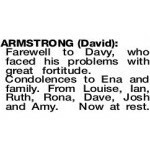 Farewell to Davy, who faced his problems with great fortitude. Condolences to Ena and family. From Louise, Ian, Ruth, Rona, Dave, Josh and Amy. Now at rest.